One of H4H’s goals is to build awareness of the ongoing needs for victims of Haiyan. 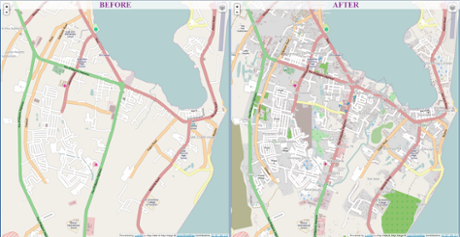 When searching the web to find out information on actual progress made, I came across an article that shows how the Open Street Map Team was able to improve the map of Tacloban City after volunteers started filling in the gaps. Thank goodness for all the volunteers! I can’t believe it! Have you seen our twitter account? More than 100 followers already! Plus, 2 of them have more than 100,000 followers! Social media can really do a lot for Hope For Haiyan! I’m so excited! There is yet another strong typhoon that is blowing over the Pacific Ocean in the country’s northeast area and may bring heavy rains, but at this point it is too far off to hit land. However, the disaster response agency has advised villages that have problems with flooding and that are near shore to keep tuned in to the weather, and take precautions. They have also advised fishermen to not go out too far. Let’s hope that if the typhoon does hit the Philippines the people will be more prepared, and no lives will be lost. Everyone keep the Philippines in your prayers and cross your fingers that this typhoon passes right over. As we close the talk of our fundraiser, I wanted to put in some important details that were left out recently. What we haven’t mentioned yet was that the money we raised is being used to feed 75 kids of unhoused families for the rest of the year! It’s just mind-blowing to me how we’ve made such a change in this world. Once we started, we couldn’t stop rolling. When I heard how much money we raised, I was speechless. I cannot describe the look on my face in words. With less than 20 people on our team, I never would have imagined we would make it this far.